To most data center managers, data center disasters are the stuff of nightmares. Disasters can strike your data center at any time. Disaster recovery, assuming you can recover, often requires a great deal of time-intensive and cross-functional effort in sub-optimal conditions. Additionally, while dealing with the disaster, you need to worry about the costly effects of unplanned downtime on your reputation, customers, and bottom line. However, perhaps most terrifying is the perception that data center disasters occur without warning. With so many fears around disasters in your data center, it’s easy to think that a reactive approach is your only course of action and that data center disaster prevention plans are well meant but ultimately unhelpful. But what we’ve found is that it is possible to not only identify harbingers of disasters but also to tackle these issues before they become problems. 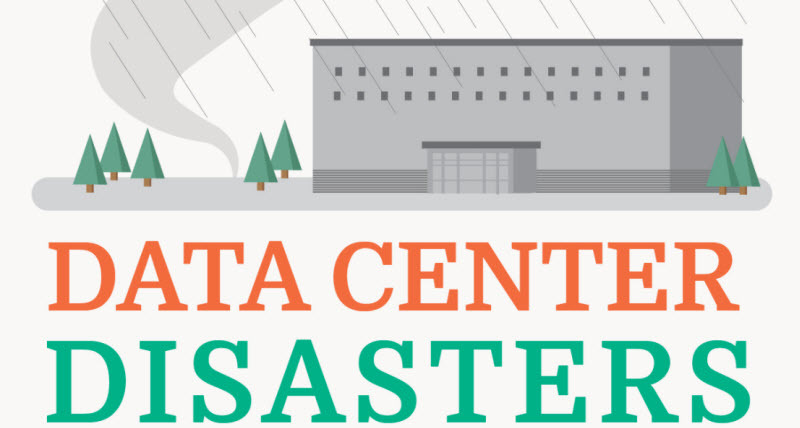 To help you understand the different causes and effects of data center disasters and how to mitigate them, we’ve developed a list of some of the more notable data center disasters in our new infographic: Data Center Disasters. The infographic organizes the disasters by cause, such as weather issues, temperature spikes and cooling failures, power outages, and equipment problems. Each data center disaster highlights the company affected, existing disaster prevention plans, and the issues that caused the disaster. Most importantly, the infographic provides concrete examples of common Data Center Infrastructure Management (DCIM) features that can either mitigate the risk or disasters or help you recover in their aftermath. For example, in 2015, Fujitsu’s equipment failure disaster prevention plan consisted of five emergency diesel generators and eight UPS systems. That year, the company’s data center experienced a major transformer station failure, causing a power outage. Fujitsu was unaware of what caused the problem; however, a DCIM health map with red, yellow, and green color coding could have helped them understand rack load levels, line currents, and all environmental conditions to quickly aid in the identification and correction of issues. Note: While it may not be possible to predict every disaster in your data center, you can limit the negative impact on your facilities by combining predictive DCIM analytics and business intelligence with a solid disaster prevention plan. Want to learn more? Check out the infographic here.